Whether you chose cording, Czechoslovakian crystal or custom edging colors, you are selecting from the finest materials we can find: European cotton yarn, lycra material for the ears made by the leading Canadian sport textile manufacturer, cording custom made for us in Montreal. Each bonnet is made to your specifications. The attention to details both visible and hidden makes Talisman Fly Bonnets the best and longest lasting bonnets available. 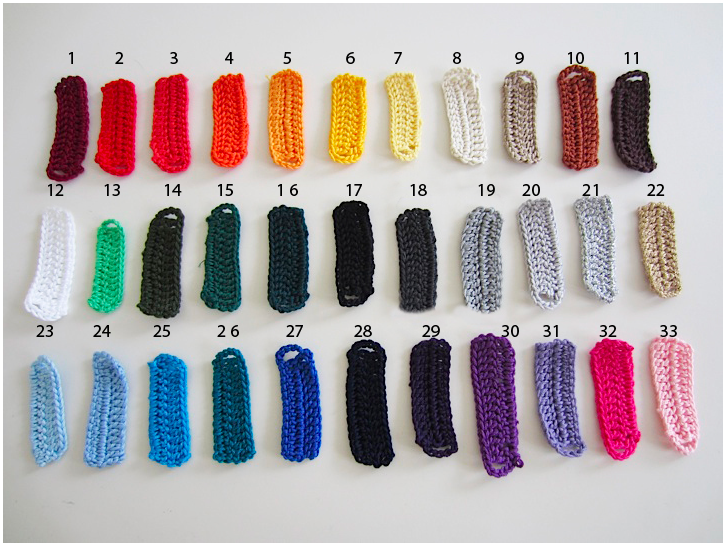 There are 33 edging colors and 17 cords for your selection as well as a wide variety of crystal chain. If you wish, a crest embroidered with your monogram or the logo of your farm or sponsor can finish the look of your bonnet. Digitizing service for converting the logo to an embroidery file is offered. Padded Quiet Ears™ are also offered as an option. Each bonnet we make comes with a talisman made of Swarovski beads in colours coordinating with your bonnet. This talisman is our trademark and is reflected in our name, Talisman bonnets! Burgundy, dark hunter green, navy, dark grey, charcoal, black, white, brown, tan. Light grey, though not pictured, is also a base colour option. Bonnets can be designed with up to five rows of crocheted colour edging. #3 ~ U-Shape – The popular squared front, another of Talisman’s original styles. #4 – Long Tie-Down style with either straight or scallop edging. 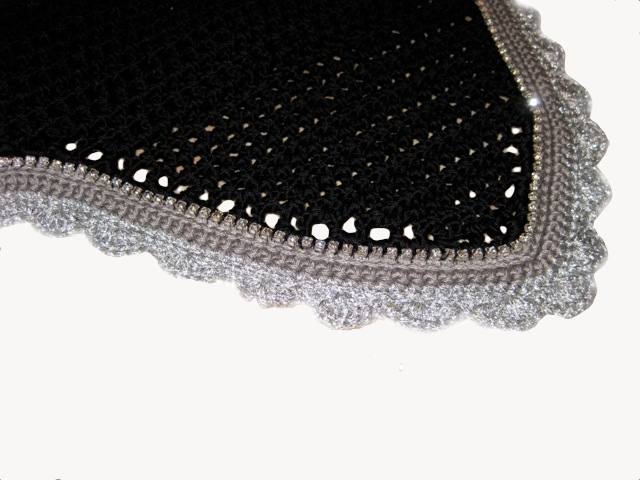 This style bonnet attaches to the flash or noseband with an elastic. We do provide premium quality embroidering services for our bonnets at an additional charge. A high resolution image will be required for logo processing. Please mark clearly on your order form that you will be requiring this service, and we will discuss details once we contact you directly to confirm your order. Simply download and fill out the online order form. Once you have designed your bonnet(s) and recorded your order, email it back to Talisman Equine. Please feel free to contact us directly for any help that might be required in designing your bonnet. Otherwise, we will contact you to confirm your order and to organize billing. Be sure to clearly write down your contact information where requested! We accept Visa,Mastercard and PayPal. E-transfer is also accepted for Canadian orders. Do you have any photos of your long tie down style bonnets? Also, what is the price range for your bonnets? I don’t need specific numbers just an idea! Thank you for the message. You will find several photos of Tie-Down bonnets on my Facebook page, Talisman Custom Fly Bonnets. Our bonnets are priced at $139CAD, crystal and cording extra. Once you have an idea of what you prefer, we can email a photo of a small sample of the edgings you select so you can have a pretty good idea of the look before we go ahead with the actual bonnets. shipping in Canada included, sales tax where applicable. If you require your logo on the front of the bonnet , we will make an embroidered crest which is then sewn onto the bonnet.There is a one time digitizing fee of $40 ( unless you already have a .emb, or .dst embroidery file of the logo). Crests with your logo embroidered on them are $18 each. I would be happy to help with any other questions you may have. Please email them to me at talismanbonnets@hotmail.com, or if you prefer to call, my cell number is 514-232-2190. Also, do you recommend transposing the colors to accommodate the different colors or horses? Head and face shapes? Hello Tahlia, feel free to send an email to me at talismanbonnets@hotmail.com describing the bonnet you had in mind. If you need help designing a bonnet, I would be happy to assist. Most of the colour options are on the order form found on my website. However, by communicating directly, you wouldn’t need to fill out the form. Thank you!